Painful, swollen joints can make it difficult to complete your daily tasks or perform your job correctly. If you have joint pain and inflammation, you may have gout. At HELLOMED in Ann Arbor, Michigan, the experienced medical team offers an accurate diagnosis and comprehensive treatment of gout to help you manage symptoms and return to your routine. Schedule an appointment online, by phone, or walk into the clinic to learn more about gout treatments. Gout is a type of painful arthritis that occurs when uric acid builds up in your blood and causes inflammation in your joints. Acute gout affects only one of your joints and chronic gout results in ongoing pain and joint inflammation in one or more locations. You may have too much uric acid in your blood because of an overproduction of acid or an inability to eliminate the acid from your body. Gout may also result if you are taking medications that interfere with the elimination of uric acid from your body, including water pills. To diagnose gout, your HELLOMED doctor performs a physical exam of your joints and may request imaging tests, including X-rays, to rule out other medical conditions. Your doctor may also order blood or urine tests to determine if your uric acid levels are higher than normal. Your doctor at HELLOMED may prescribe over-the-counter or prescription nonsteroidal anti-inflammatory drugs for acute gout symptoms to reduce swelling and inflammation in the joints. They may suggest other medications to control symptoms during gout flare-ups. Untreated acute gout cases can progress to a chronic condition. For chronic gout symptoms, your doctor may recommend corticosteroid injections to relieve pain and inflammation of joints. If you have severe attacks or damage to your joints, you may need daily medication to reduce the levels of uric acid in your blood. 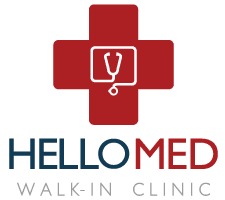 The healthcare providers at HELLOMED review your medical history to create a specialized treatment plan and monitor your gout symptoms through regular primary care appointments. To learn more about available gout treatments, walk into the clinic, or schedule an appointment online or by phone.